The British Midlands. It’s called the “Black Country” for a reason. Bad things happen there. When members of a prominent family disappear from a coal-mining village – and a human eyeball is discovered in a bird’s nest – the local constable sends for help from Scotland Yard’s new Murder Squad. Fresh off the grisly 1889 murders of The Yard, Inspector Walter Day and Sergeant Nevil Hammersmith respond, but they have no idea what they’re about to get into. The villagers have intense, intertwined histories. Everybody bears a secret. Superstitions abound. And the village itself is slowly sinking into the mines beneath it. Not even the arrival of forensics pioneer Dr. Bernard Kingsley seems to help. In fact, the more the three of them investigate, the more they realize they may never be allowed to leave…. 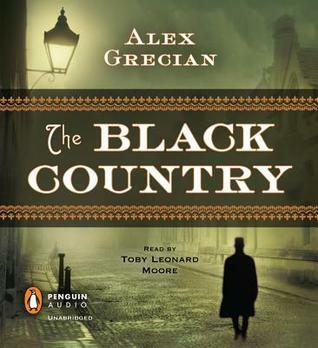 I finished The Black Country over a week ago. I kind of wish I had written the review then instead of putting it off ’til now. It’s not a book to think about. It’s a book to go along with the flow and then put away when it’s overs. Day and Hammersmith arrive in a small coal mining town where three people have disappeared, a father, mother and young child. The more the pair investigate, the more the town seems to be full of dark secrets. And there’s the folktale of Rawhead and Bloody Bones, the local boogie man, who some seem to fear has gotten the family. It’s a good, atmospheric historical mystery. The town is sinking, literally, into the mines and the dark and dirt pervade the whole story. The townspeople believe in omens and sign and they almost make you believe too. The two detectives are clearly out of their element, but are determined to find the missing people, alive or dead. As I was listening I got sucked into the story, wondered where it was going next, what exactly were the secrets people were hiding. And I do like Day and Hammersmith. They are truly good guys, and intelligent. Kinglsey didn’t get featured much here, although his observations help lead to the solution. The problem is, upon reflection, there is just too much going on. There’s the missing family and a plague that seems to have struck the village, with nigh on 70% of the village ill, then you’ve got another out-of -towner who is being pursued by a disfigured man because of something that happened during America’s Civil War, along with interludes from that time. The vicar’s wife has a secret she tries to tell Day but is too vague. There’s a blizzard. Hammersmith gets poisoned and comes down ill but still manages to be useful. Day’s pregnant wife stops by for half a day. Then the local constable disappears, but no one seems to actually notice. And the buildings are sinking, sometimes quicker than others. And there’s a baby bird and a pig’s eye. The end is a mish-mash of everything all at once, confessions, revelations, snow, fire, guns, Rawhead and Bloody Bones. Too convenient and yet too absurd at the same time. But when I was listening, it didn’t strike me that way. I’m not usually one to read books with kids as characters. I’m not sure why exactly, but there it is. Here, however, the kids are interesting or disturbing, mostly disturbing. The narrator did a good job. There were a lot of characters but he made them all distinct. Also, I think he is part of why you could get lost in the story without feeling like it was melodramatic; he maintained control, made it all seem reasonable somehow. It’s enjoyable, fast-paced although with perhaps too many strings. But maybe real life can be a little like that sometimes. If my house were going to catch on fire, it probably would be the same day I lost my job or my car broke down, you know. Unrelated but all happening at once. I read the first book in the series and I am not sure whether I want to continue it. This is a good review, gives me a lot of information. I’m probably not focused enough to read a book like that right now. Looks like it has potential. We’re going to visit the Black Country area of England because my husband is interested in the Industrial Revolution, so I might like this just for the setting. This would be a good post for British Isles Friday on my blog.